I’m counting on the collective wisdom here to figure out why the Rider won’t run. Bill Lindsey and I have been PMing and I’ve implemented all of Bill’s suggestions. 1. No binding when hand turning the flywheel. 3. 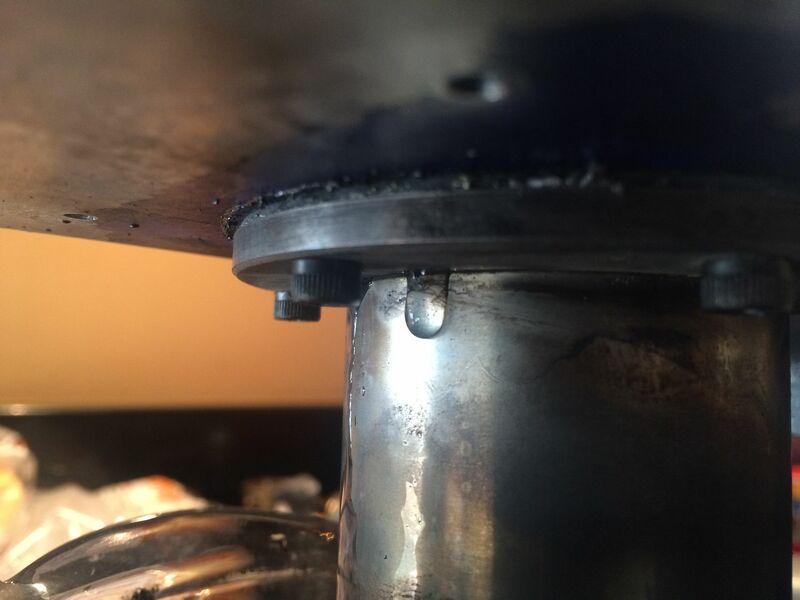 Gaskets (standard auto supply gasket sheeting) between the Hot cap and base and the cylinder and base are providing a good seal. 4. Temperature at the hot cap bottom is 450-500 F.
5. Temperature at the cylinder liner ID is around 80 F.
6. The teflon piston packing has been run in and is not leaking air. This is based on using the laser spot on the non-contact thermometer to measure temps at the piston’s top edge where it contacts the liner ID. The readings at many places are unchanged at about 80 F.
7. I have a good, close sliding fit where the displacer rod goes through the piston center. I remade this center and made it a tiny bit tight then ran Timesaver compound until the tightness disappeared. 8. The displacer piston bottom, at its low point, it within 1/32” from the hot cap bottom. 9. I start the burner and try starting the engine each minute. I’ve done this for up to 10 minutes and notice no difference in feel as I turn the flywheel. Yes. I’ve tried turning the flywheel in both directions. Re: Rider Ericsson will not run - HELP!!! Is the displacer OK I have had them split? You must be reading my mind. I'm waiting for the hot cap to cool down to check it for leaks. I'm also going to bubble test all gasket to base connections. Stan, you may be leaking air through the gaskets. When you spin your engine over is should be bouncy against compression. If it doesn’t bounce back and forth, it either is too tight or has leaks or a little of both. Having seen the quality of your work I doubt that it is too tight. I would ditch the gaskets and try a high temp gasket sealer. Everything points to an air leak. The likely cause, as Bill pointed out in a PM, is a resolder that I did weeks ago to the beautifully, paper thin hot cap bottom. I'm going to pull the hot cap and do a leak test. I respectfully differ on the idea of a bouncy piston. Stirling engines don't have that much compression especially in the cool state, unlike an IC engine. Mine has very little "bounce" to it and yet still runs well. Bill has a point too. I tried making a Stirling engine as a first project some years ago but never did get a good runner. I talked to just about anyone who was running them at engine shows. Some had remarkable bounce, yet others had very little and they all seemed to run OK.
One thing's for sure, if you have a leak it won't run. Also, since power output is on the low side so any tight spots will prevent it from cycling. Good luck Stan. I know you'll get it. I’m just going off my personal engines; I have 5 running hot air fans, 3 originals and 2 that I have built. They all bounce; my Essex fan has so much compression that it is difficult to turn over when cold. I pulled the hot cap and sure enough it had a small leak at the bottom. I unsoldered the bottom and made a new one. Soldered. No leaks. Reinstalled. No difference in "compression" feel. Still not a runner. I've brushed my leak tester (half and half dishwashing liquid and water) on every joint, including the piston center. No bubbles. ????? I'm considering removing the piston and displacer and filling it with water to see if I get a leak anywhere. I'm sure you have checked, but is the timing correct? Displacer leads the power piston by ~90degs. It has been a while since I have looked closely at the Rider, so I don't know if the timing is built into the linkage or if it is adjustable. My buddy has one of these that he also built from a Myers kit and it runs great, I will ask him if he has any ideas. The timing is built in to the engine design. Not adjustable. Don't think you could assemble it in such a way that it would turn and have the timing off. Keep coming up with suggestions. I'll try anything. Dave, I wasn't trying to be argumentative by any means. The linkage of the RE is heavy to start with. My little fan does in fact have a small bit of compression, but much lighter linkage too, so you may be right on linkage hiding some of it on the RE . Stan, I am about out of ideas now, but it has to be something minor I really believe. It is nice that we can present different ideas about our experiences and findings with our projects. The 'Cup of Tea' engine I built a few years ago just would not run no matter what. I put photos on another forum (specifically for hot air engines) and a couple of members suggested the flywheel might have been a bit on the heavy side. I reduced the weight by about half and it ran straight away. Given the number of these that I've seen running at shows from the same casting set, I assume that the flywheel (it is quite heavy) weight is correct. I will put that thought on the ever-growing, "why won't the damn thing run" list. Last night, I took the engine apart and measured everything against the print dimensions. No help there. Everything is "close enough," however, a clue surfaced. When I removed the flywheel and moved the beam without it, the piston was quite tight in the cylinder. I hadn't noticed this when hand turning the flywheel because it's mass was masking the tightness. I put the engine on the lathe bed and "ran it in" for 15 minutes. This loosened things up quite a bit as the cylinder packing seated. Actually, after 10 minutes, I didn't detect any difference in movement so I assume the packing is compressed as much as its going to be. If it's still not running, I either need a smaller diameter packing or I'll put the piston back on the lathe to very slightly deepen the packing groove. A report will follow later today. Again, thanks for all of the suggestions. Keep thinking. Robert, what sort of displacer does it have, sealed cylinder, or with a regenerator built into it? If the former, check it for leaks, take it out and put it in a pot of hot water, if it blows bubbles that's your problem. Stan, if it is not too difficult try a temporary lightweight flywheel in aluminum of similar just to disprove/remove this as a possible reason. As a note of further interest.... I recently bought the Myers casting kit from a friend of mine. I think it dates back 30 years or so. My friend gave me two flywheels for it. One was the stock aluminum one and the other was cast iron and it's quite a lump of iron. The story goes that some folks had trouble getting this engine to run with the stock ally wheel because it was too light so Myers also supplied the cast iron flywheel for it. I think I got that right. With that CI flywheel, no heat needed. Just give it a spin. Should run for about a week. It seems 90 per cent of Stirling problems boil down to two things: friction and leaks. Sounds like you are on to it with the teflon seal ring. An old rule of thumb is that you should be able to spin the flywheel and have it continue turning over for a revolution or two. IE virtually no friction at all. I don't know if the teflon piston seal ring is standard procedure on those RE kits, but it is pretty unusual to have piston ring/s in a Stirling, as Ian said. For leaks it might be worth lightly pressurizing the whole system to a few psi with comp air or bicycle pump etc and put the whole thing under water to look for bubbles. I think I've found the problem (or at least one problem). The consensus seemed to point to drag or a leak. Even without the flywheel mass, I can easily move the beam and the piston seems pretty free. So, I removed the entire top end (beam, piston, displacer, etc) and filled the engine with water. Look here at the hot cap flange. I'll address that this morning. Perhaps it will run. Looks like you may have found the culprit Stan...keeping my fingers crossed !! I think you should be able to cure that with some Loctite, that's what I use to attach the flange to the hot cap instead of brazing it. As for fly wheels, when you get it going, try an experiment, take the flywheel off, then start it, it should run, fast, but no torque. There is enough flywheel effect in the crankshaft, and the rest of the mechanism. I had considered Loctite but even the HiTemp Loctite putty has a max temp of 450F. My hot cap, at the bottom, is measuring approx 450. I've put Quick Steel around the flange. It's for repairing manifolds, etc and has a max temp of 2400F. why does a displacer need to be airtight? a one-way valve in the displacer so that it would maintain the highest engine pressure inside. This was said to be because it would tend to be a more viable pressure vessel than vacuum vessel. Thanks to everyone for the help, suggestions and off-the-wall comments. It all helped to give me a direction to search for problems. It's obvious that the hot cap leak was one reason, but I also did other things. Not sure if they fixed any issues but they may be helpful for some future builds that may not run. 1. Remade the piston center for a tighter fit to the displacer rod. Then, today, I opened the bottom up by .001. ???? Assembled and disassembled at least 50 times. I'm really good at it now. I still have some drag on the pump which I suspect is a pack nut adjustment or packing issue. I'll address that tomorrow. Now I can (after I run it a few times and just watch it) take it apart, sand, file, fill and generally get it ready for painting. I also have to get the pump side plates to the laser engraving guy for the Victorian scrollwork. I'll be posting the last few installments of the build log over the next week. Again, thank you, thank you and thank you. Thank God Vern, I was bout ready to pack my gear and head your way to help out. Great to see it running and I think we should have a to celebrate. Now bring on the fancy. I'm sitting outside, single malt in hand. I was beginning to think it wouldn't ever run and was ready to show up on Bill's doorstep, engine in hand. Not very forgiving are they? There is a fine line on the pump gland between leaking and too tight! I think my buddies engine always seeps a little at the gland, he just mops it up from time to time. One other observation he has made is the Teflon packing on the piston shrinks over time. He can start out with a new piece and after running a period of time it will have shrunk enough to open the end gap a considerable amount. Doesn't seem to effect the running of the engine though. I told him that it was that cheap Chinese packing that he was using. It seems that all Lowes or Home Depot has is cheap Chinese packing. It is interesting that it shrinks. Ian has commented that it expands. Go figure. Congrats on getting that stubborn beast to run! Geeee! I knew you would get it solved Stan and congrats buddy. In addition to my PM let me congratulate you publically on a fine runner. You did a much better job on your build log and that will be a nice resource for future builders. My experience on the cheap Teflon packing is that it shrinks and must be replaced over time. One of these days I will make a Teflon ring for it and be done with it. Job well done my friend!!! Conratulations Stan. Way to stay with it and get it running. Thanks for the kind comments. I'm more relieved than anything. There was no chance of giving up after more than three months on this build. Nearly every day. I was just hoping that it wouldn't be a life's work to make it run. Great news! Great fun to watch running. Reminds me of that old saying 10% inspiration 90% perspiration. Hi Stan, congratulations. Good to see that you have been sucessfull at the end and the beast is alive now. Enjoy your malt. Nice to see it running. Congratulations, they all seem to go eventually, some times you have to threaten them, and cause the air to become a bit blue. And some times I'v ended up with a sore wrist flicking the flywheel. I've been following this. I knew it would run some day. Congratulations.